I am really excited to start releasing the information obtained from our recent yoga asana survey. First, I want to create the context for why I decided to do the survey in the first place. What is the intention here? What efforts did we take to gather the information? Where are we going next? You can help us decide further down the article by selecting your preferred order of topics related to the survey results. Before going further, a special thanks to everyone on my side of the screen who helped me make this a real survey that will contribute real data in a scientific way. A really big thanks to those of you who participated and shared the survey on social media or in other ways. 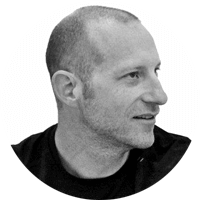 When the idea of the survey came about (through a conversation with a good friend), it was just after the William Broad article hit the New York Times. Remember that one? I was appalled by the article as were many other people. I wasn’t appalled so much because there was a suggestion that people could get injured while doing yoga. No, not at all. I’ve been around long enough to observe injuries from doing asana. No, it was the use of obscure and dramatic examples of injuries that seemed (intentionally or not) to imply that it was possible that on any given day, in any given pose, you might die! OK, I’m exaggerating. But it left many people with the feeling that serious injuries might be happening on a daily basis. 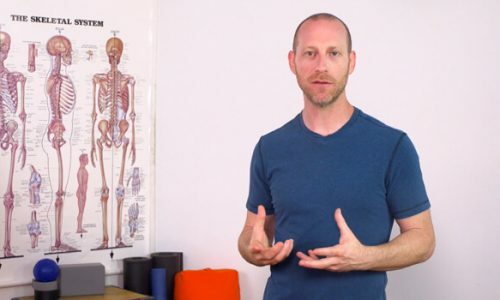 I run around the world teaching… ANATOMY to yoga teachers and practitioners. Can you imagine the kinds of questions I was getting after that article came out? You can read my initial response to the Broad article here (By the way, the book was great). 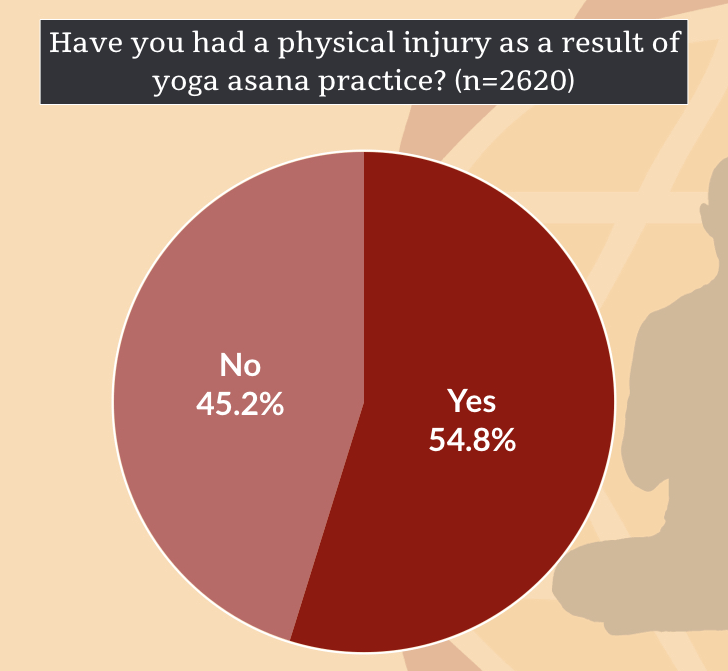 Of course, the questioning of whether and/or how we are getting injured is TOTALLY appropriate, hence the yoga asana survey. What I did not feel was appropriate was the continued use (after the article) of dramatic injuries to lead more practitioners, unintentionally or not, to believe that these types of injuries are happening on a regular basis! Let me be clear about my position. I have always known that you could get injured while doing asana. I have never lived in an alternate universe where asana can only cure. I have for years described the asana as neutral. In fact, I go further and say that the asanas don’t even exist until we do them. Note that WE are attempting, performing, achieving, failing, or injuring ourselves! We may or may not be ready to do them. The full expression of the posture may not be appropriate for us at all given our constitution and structure! There are a myriad of reasons, but in the end, it is us who decides to do it. 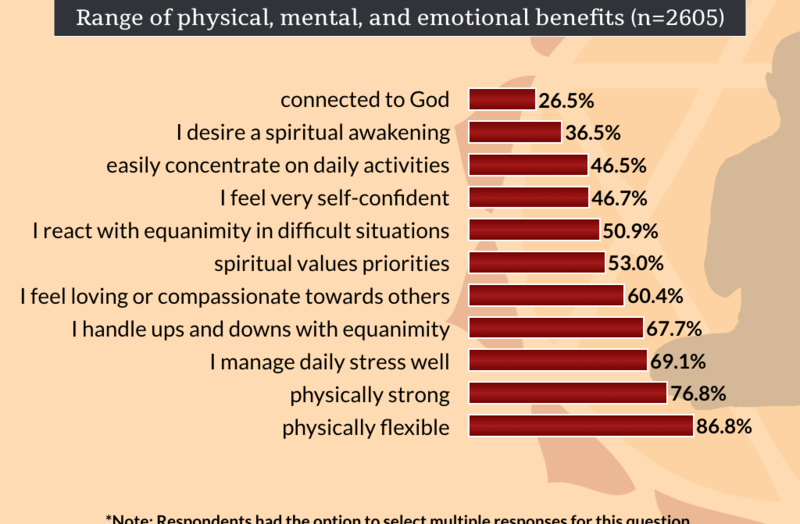 In the end, I am happy that the conversation continues and believe that the data from this survey will help with the very real concerns of yoga practitioners around the world. The fact that the conversation continues shows that there is a strong interest among yoga practitioners to better understand the body that we use as a tool for our “spiritual practice” and the impacts that the practice has. Now, let’s see what the numbers say. Was there a prior injury in that area? Was it hot or cold, both inside the room and outside? How old was the practitioner? What other activities did the practitioner do? There are many other questions we could be asking as well. My point here is that context matters! Just because something happens while doing an asana does not necessarily mean that there aren’t other factors that if removed completely, would mean that you would not be injured while doing that posture! In addition, I also wanted there to be some sense of what benefits people perceive from performing their practice. So we also asked questions about healing of injuries, as well as changes in habits of lifestyle. What we hope to do with this project is provide some answers to these questions, and more importantly, add context to the conversation. Yoga asana practice does not occur in a vacuum. Our past health and movement histories, as well as the activities we do concurrently with yoga, impact our physical, mental, and emotional experiences. Hours were spent on the experimental design for this yoga asana survey. When we launched it, we also wanted to do so in the most unbiased way possible. We painstakingly chose the words that went with the image and title. This was on purpose. To begin distributing the survey, I reached out to Yoga International. They were willing to write a brief article and share it across their social media. Their audience provided a good cross-section of the diverse international yoga community. I also reached out to the broader yoga community via the Yoga Alliance directory, my Facebook page, my personal page, and my newsletter list. We had 2,628 people take the self- administered survey! The self-reporting nature of the survey and its data should always be taken into account as we describe relationships in the data and extrapolate to discuss what people are experiencing in yoga. The total sample size was large enough (> 400 completed surveys) to control for the necessarily opportunistic nature of the survey distribution and voluntary completion. Our resulting sample size allows for statistical analysis of relationships in the data at α=.05 (95% confidence level). Although the initial intention of the survey was related to the topic of injuries we also wanted some space for positive outcomes of practice. We had five primary questions related to injuries. Of those five, participants could choose either 1, 2, or 3 three injuries. Each of those had eighteen sub-questions related to that injury. We asked four primary questions related to positive outcomes of asana practice. One of those four had two sub-questions. We asked additional questions about general health and activities of participants. We now have actual data that speak to the impacts of asana practice. This is completely different than putting a message out on facebook and saying something like: If you’ve ever been injured while doing asana, I’d like to hear about it. While that might encourage people to come forward to tell their story, it says little about overall trends in the impacts of asana practice, positive or negative. We will be releasing posts related to the yoga asana survey data on a regular basis on yoganatomy.com. They will show up in the monthly newsletter. In addition, we have a journal article already being prepared to share some of the information from the study at a greater level of detail than covered in articles here. You can help decide what we share first by re-ordering the questions below. Put them in order from most important to you at the top to least important at the bottom. Drag the following questions up or down and into the order you would like us to explore, first to last? Is there a relationship between gender and self-reported injury in yoga? What experience do practitioners report regarding the impacts of physical adjustments/assists on their yoga practice? In what ways do practitioners report yoga practice impacting daily habits such as sleep, diet, alcohol consumption in their life? Is there a relationship between age and self-reported impacts of yoga practice? Who is practicing yoga? 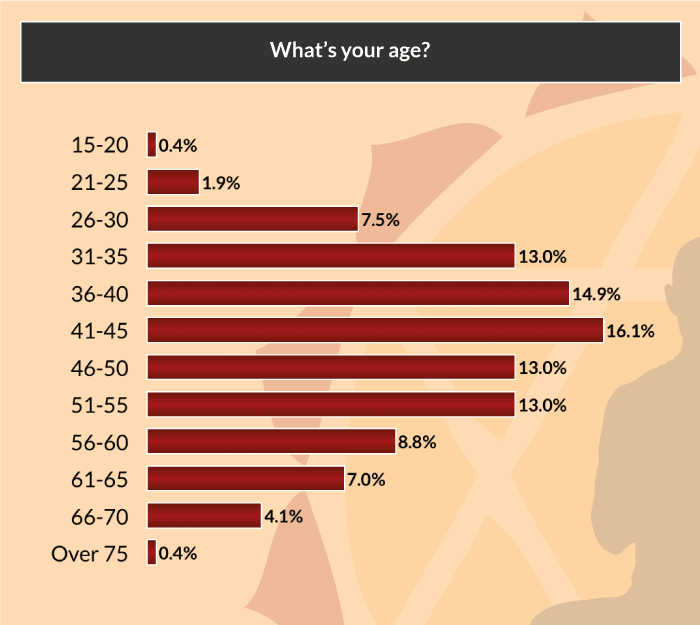 What are our demographics as a yoga community? Who responded to our yoga asana survey? A total of 2,628 respondents answered some portion of our survey! Our respondents live in 67 different countries! The greatest number (n = 2628) were from the United States (40.4%), followed by the UK (16.7%), followed by Canada (4.5%) (Image above). 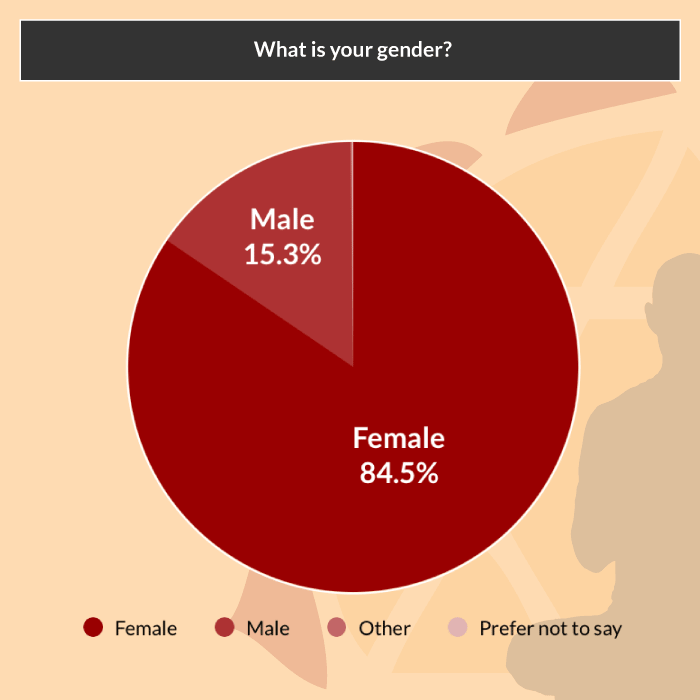 Respondents identified themselves as primarily female (n = 2625, 84.5%) and between the ages of 31 and 55 (n = 2625, 70%). Their primary reason for starting a yoga practice (n = 2483) was physical (54.5%), although mental and emotional reasons for starting practice also resonated (25.1%). A large percentage of respondents also do other yoga practices in addition to asana (n = 2615), like pranayama (72.5%) and seated meditation (67.8%). 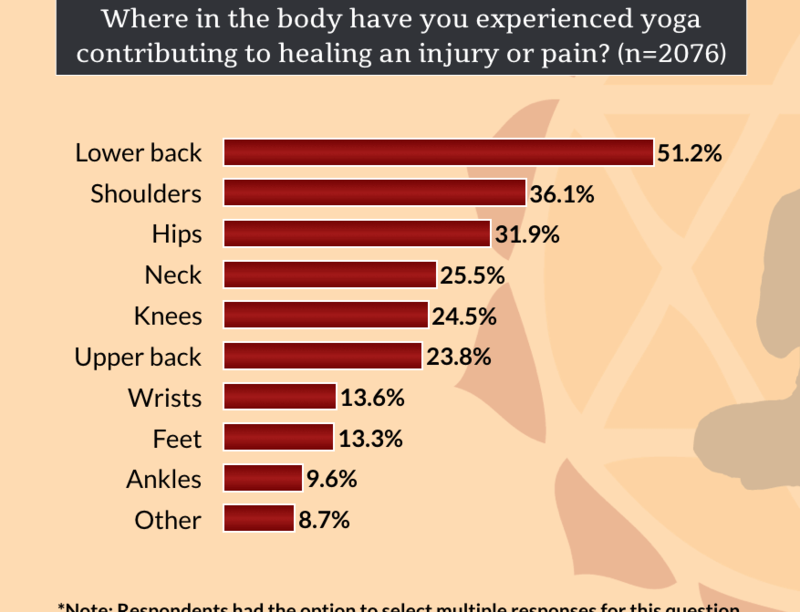 Respondents to our yoga asana survey tended to be long-term practitioners of yoga asana (n = 2624); 45.1% stated that they had been practicing for more than 10 years. An additional 36.2% stated they had been practicing for 4-10 years. More than half of respondents (60.1%) reported that they also teach yoga (n = 2620). 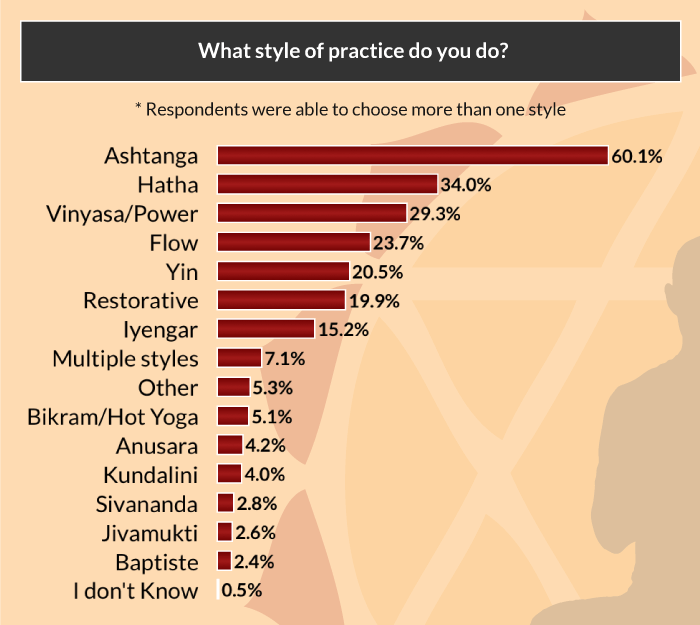 Among styles of practice (n = 2624), Ashtanga practitioners (in the style of Pattabhi Jois) were heavily represented in our survey (60.1%), with the second largest group reporting that they practice hatha (34%) and the third largest group practicing vinyasa or power yoga (29.3%). We recognize that the number of respondents who report practicing Ashtanga is likely an artifact of the outlets that we used to contact potential survey participants. We are adjusting for this potential bias when examining relationships in the data set. *Note that respondents were able to select ALL of the styles of practice that they do when responding to this question. Be sure to follow us on Facebook and subscribe to our email list (in the sidebar) so you can see the yoga asana survey results as we post them.